Maybe it’s the business environment we live in today, where people are treated as if they are “starters” or “benchwarmers” on a football team. The posters on the wall read “Go For It” and “Make It Happen”. Everybody’s “stepping up to the plate” or “going the extra mile” to do something that ultimately will not matter to anyone, not even the competitors. Let’s see who can send the quickest fax. Let’s see who can build that app using the least code. Let’s see who can make the most sales calls in the next four hours. You hear this kind of crap all the time. 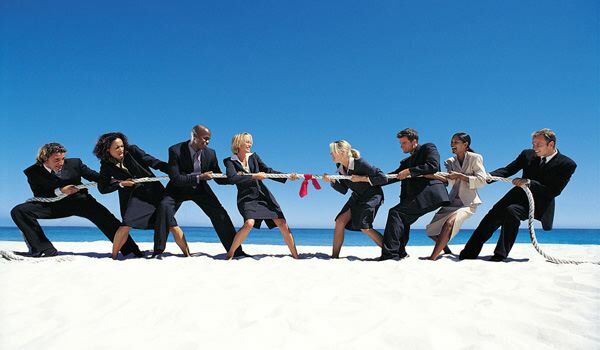 The competitive spirit is alive and well in business today. The problem is, the people are not alive and well because of it. We’re sick. Not just in the twisted sort of way, but I think it’s bad for our overall psychology. Maybe it’s all the reality shows we watch nowadays, where people compete to become models, business executives, hairdressers, or chefs. Chefs! You’ll notice it’s always more exciting to watch people get “kicked off the island” or “sent home” or even “fired” than it is to watch somebody win. Fired. In the deepest, longest recession I can remember, we’re glorifying the firing of people who are trying to make a living. And we call ourselves adults. Did junior high school end or is it still going on? Am I missing homeroom right now? Do I need a hall pass? If I make the coolest PowerPoint slide, will the cheerleader notice me? To me, competition only has one purpose, to improve yourself. If the competition is meant to benefit only others, in the form of sales leads, ratings, viewers, t-shirt sales, or rankings in a school or business magazine, it is not the proper place for competition. Competition is for lacing up your shoes and running faster, jumping higher, throwing further. And I don’t mean as a metaphor for crunching spreadsheets, but for actual running, jumping and throwing. Competition is not even meant to compare yourself to others, but to yourself. Can you run faster than you did yesterday? Can you climb higher than you did last week? Competition should matter the most to you, and nobody else. You want to beat your previous performance because you just want to, not because there’s a paycheck, a trophy, or a bonus in it. If you’re looking for kudos from the boss or your viewers, you’re in it for the wrong reason. If you’re forced into a competitive situation where it doesn’t belong, you need to get out, for your own sanity. Now how do you do that in today’s business culture, where it seems everyone acts like they’re still on the junior high school playground or the racquetball court? It’s easy; You have to say “No”. Probably to people who factor heavily in your ability to pay your rent. It may take courage to scale high mountains, face raging rivers, or stare down treacherous cliffs, but it takes the most courage to say “I will not play your game.” Especially today, when everybody is force-fed reality shows and business leaders are hopped up on motivational books like major league ballplayers on steroids. I say let’s keep the competition where it belongs, on the field, or track, pitch, or court. And let’s keep the office as a place of work. This entry was posted in Email Marketing, Marketing, Online Marketing and tagged business competition, company competition, compete business, competitive environment, competitive office, competitive skill, competitive spirit, marketing competition, office compete, office competition, professional competition by Tom Bishop. Bookmark the permalink.